Enjoy the top 2 famous quotes, sayings and quotations by Adrian W. Lilly. “Woodward and Bernstein," Jared said from seemingly nowhere. "They were just two reporters. Yet, they broke the Watergate scandal. They toppled an administration. Thats us." 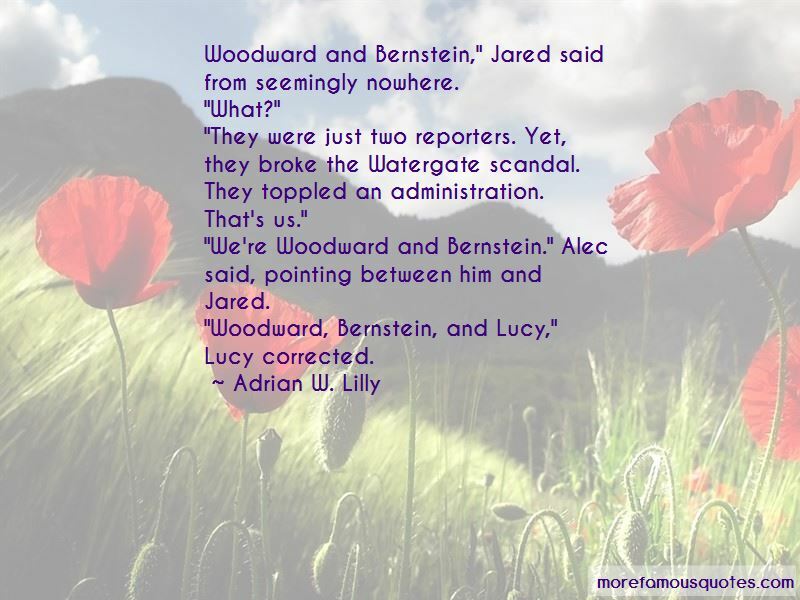 "Were Woodward and Bernstein." Alec said, pointing between him and Jared. “A spontaneous giggle burst from both of them. "This is too awkward," Alec said. Alec looked up at Jared, his eyes betraying his anxiety. "Have you ever kissed a guy?" Jared asked. electric jolt through his body. He pulled back and smiled. "That was okay." "They were just two reporters. Yet, they broke the Watergate scandal. They toppled an administration. That's us." "We're Woodward and Bernstein." Alec said, pointing between him and Jared. Want to see more pictures of Adrian W. Lilly quotes? Click on image of Adrian W. Lilly quotes to view full size.